It’s not just because he rocked the speed skating four years ago in Torino. And it’s not just because he’s also a fantastic ballroom dancer and champion on Dancing With The Stars. 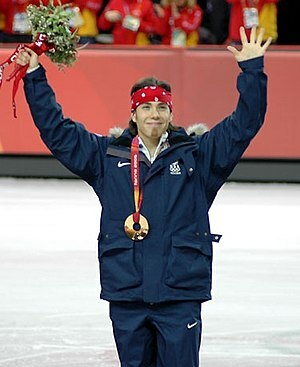 Apollo Ohno won a bronze medal on Saturday evening in the 1,000 meter short track speed skating event. The race was remarkable. Ohno started out in third place, seemingly outpaced by the two French skaters who made a strong and impressive start. On one of the turns, just as he was making his trademark “come from behind” move, the unexpected happened. Ohno made a slight navigational error — probably a few degrees difference in his usual trajectory — and would have wiped out, had he been a lesser athlete. He managed to stay on his skates, but lost enough balance and time to slip into last place. And then — he fought his way back. Although the two Koreans took the gold and silver, he slipped past the two French skaters who looked like they had it all locked up at the beginning of the race. He recovered brilliantly from the unexpected, and still won a medal. Not only was his performance remarkable, the response of the television commentator was refreshing. No expressions of disappointment, or that “2nd (and 3rd) place are still losers.” Just amazement at the accomplishment and perseverance of this extraordinary athlete. It was the first instance in a long time where the media representatives did not jump on the negative angle. That struck me as historic, as well. Apollo Anton Ohno now has seven medals, a US and Winter Olympics record. As Moshe Feldenkrais said, “The extraordinary person is not the one who remains standing, but the one who falls and can return to standing.” Adaptability, strength, skill, and the joy of doing something well, even if you don’t win the gold — that’s a lesson in character and inspiration for us all. And that’s why I love Apollo Ohno.